Grand Scale Steam Railways Of Wisconsin - “Grand Scale” describes a miniature railway large enough for the operator to ride inside the locomotive. Our feature takes you to three of the state’s Grand Scale railways: the Riverside & Great Northern, the Milwaukee Zoo, and the Whiskey River. The locomotives are small, but they work and sound like their big brothers. 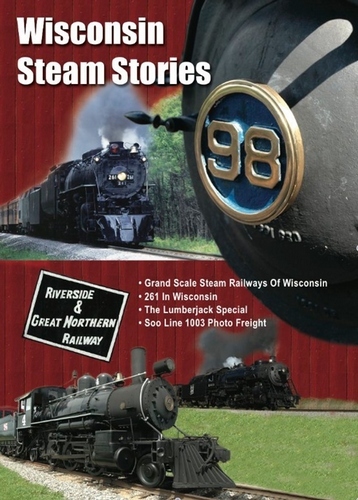 We also explore the history of building Grand Scale equipment in Wisconsin by yesterday’s Sandley Works and today’s Merrick Light Railway Equipment Works. 261 In Wisconsin - Our program covers several trips in different years made by Milwaukee Road 261, focusing primarily on round trips between Milwaukee and New Lisbon. This was home territory for the big Northern when it was still in service for the Milwaukee Road! Includes both HD and analog footage. The Lumberjack Special - The Laona & Northern carries passengers from its hometown to the Camp 5 Museum. Built in 1916 by Vulcan, 2-6-2 number 4 puts on a great show! We cover a day with the locomotive, beginning with the engine house crew starting the fire, greasing, washing, operating out on the line (including a cab ride), then back into the barn for the night. Soo Line 1003 Photo Freight - 1003 is a 2-8-2 Mikado type locomotive, built in 1913 by the American Locomotive Company. We had a glorious October weekend; the images of 1003 and her train are stunning as the special worked its way between Hartford and Fairwater on the Wisconsin & Southern. Lots of runbys!